Srila Narottama das Ṭhakura was a leading acarya in the Gaudiya Vaisnava Sampradaya. He is most famous for his Prarthana, a composition of thirty-three Bengali songs. Srila Prabhupada quoted extensively from Narottama das Ṭhakura in his books, classes, conversations and letters. Although an eternally liberated soul, Srila Narottama's songs were written as if he was a fallen, conditioned soul in need of Lord Caitanya's causeless mercy. Therefore, we can all greatly benefit from hearing Srila Narottama das Thakura's transcendental songs which are steeped in the highest devotional mood. "One devotional song by Narottama dāsa Ṭhākura states: 'My dear Lord Caitanya, please have mercy upon me. There is no one who is as merciful as You. My plea is most urgent because Your mission is to deliver fallen souls, and no one is more fallen than I. I beg priority.'" "Śrī Narottama dāsa Ṭhākura has sung that the best qualification for taking shelter of the lotus feet of Lord Caitanya is to be the most fallen because the Lord came specifically to deliver the fallen souls." "Narottama dāsa Ṭhākura has sung, śrī-kṛṣṇa-caitanya prabhu dayā kara more. He prays for Lord Caitanya’s mercy because He is the mercy incarnation, having appeared especially to reclaim the fallen souls. The more fallen one is, the greater one’s claim to the favor of Lord Śrī Caitanya Mahāprabhu. One must only be very sincere and serious. Despite being contaminated by all the bad qualities of this Kali-yuga, if one surrenders unto the lotus feet of Śrī Caitanya Mahāprabhu, the Lord will surely and certainly deliver him." "In Śrīmad-Bhāgavatam (SB 11.19.21) Kṛṣṇa says, mad-bhakta-pūjābhyadhikā: 'It is better to render service to My devotee.' Thus, according to the Gauḍīya-Vaiṣṇava philosophy of Caitanya Mahāprabhu, it is better to be a servant of the servant of God. One should not try to serve Kṛṣṇa directly. A pure Vaiṣṇava serves a servant of Kṛṣṇa and identifies himself as a servant of a servant of Kṛṣṇa. This is pleasing to Lord Kṛṣṇa. Śrīla Narottama dāsa Ṭhākura confirms this philosophy: chāḍiyā vaiṣṇava-sevā nistāra peyeche kebā. Unless one serves a liberated Vaiṣṇava, he cannot attain liberation by directly serving Kṛṣṇa. He must serve the servant of Kṛṣṇa." "One has to approach a pure devotee. Narottama dāsa Ṭhākura sings, chāḍiyā vaiṣṇava-sevā nistāra pāyeche kebā: 'Who has been elevated without rendering service to a pure Vaiṣṇava?'" "Even though a person is rejected by the Supreme Personality of Godhead, the devotees of the Lord do not reject him; therefore the Lord’s devotees are more merciful than the Lord Himself. Śrīla Narottama dāsa Ṭhākura thus sings, chāḍiyā vaiṣṇava-sevā nistāra peyeche kebā: one cannot be relieved from the material clutches without engaging in the service of pure devotees. The Lord Himself may sometimes be very hard, but the devotees are always kind." "Anyone who wishes to advance in Kṛṣṇa consciousness must try to serve the devotees of Kṛṣṇa. As Narottama dāsa Ṭhākura says, chāḍiyā vaiṣṇava-sevā nistāra peyeche kebā: 'Without serving a self-realized Vaiṣṇava, no one has ever been released from the materialistic way of life.'" "In family life, or any life, one cannot be perfectly happy without being Kṛṣṇa conscious. Śrīla Narottama dāsa Ṭhākura prays that he will have the association of a person—either a householder or a man in the renounced order of life—who is engaged in the transcendental loving service of the Lord and is always crying the holy name of Lord Caitanya." "Śrīla Narottama dāsa Ṭhākura has sung, 'My dear Lord, let me be engaged in Your transcendental loving service, as indicated by the previous ācāryas, and let me live in the association of pure devotees. That is my desire, life after life.' In other words, a devotee does not much care whether or not he is liberated; he is eager only for devotional service." "So actually it doesn't matter if one is householder or brahmacari. Sincerity of purpose is the only qualification for Krishna Consciousness. Sri Narottama das Thakura says that he hankers after the company of any person, never mind whether he is in the renounced order of life or in householder life, just as long as he is merged into the ocean of Krishna Consciousness. That is the one qualification." "It is the advice of Narottama das Thakura to chant the holy name of Gauranga either if one remains at home or in the forest. Similarly, do not forget the chanting of the Hare Krishna mantra either you live in the temple or at home." "Since Kṛṣṇa and His holy name are identical, the holy name is eternally pure and beyond material contamination. It is the Supreme Personality of Godhead as a transcendental vibration. The holy name is completely different from material sound, as confirmed by Narottama dāsa Ṭhākura: golokera prema-dhana, hari-nāma-saṅkīrtana. The transcendental vibration of hari-nāma-saṅkīrtana is imported from the spiritual world." "This human form of life is gotten, we have received, after many, many births. These people, they do not know. It is very rare. Therefore Narottama dāsa Ṭhākura sings, manuṣya janama pāiya, rādhā-kṛṣṇa nā bhajiyā, jāniyā suniyā viṣa khāinu. Hari hari viphale janama goiṅu. He is lamenting, 'My dear Kṛṣṇa, I am so unfortunate. I got this human form of life. It was meant for developing Kṛṣṇa consciousness. But I have wasted my time otherwise. So how it is so? 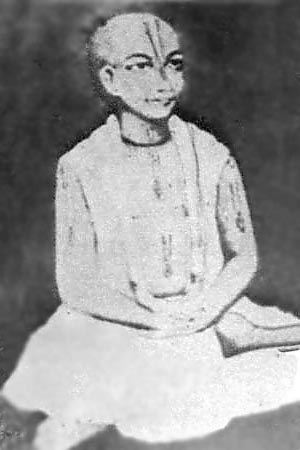 Jāniyā suniyā viṣa khāinu. Knowingly I have taken poison. Knowingly." "Śrīla Narottama dāsa Ṭhākura, who is famous for his poetic composition known as Prārthanā, has lamented in one of his prayers, 'When will Lord Nityānanda be merciful upon me so that I will forget all material desires?' Śrīla Narottama dāsa Ṭhākura confirms that unless one is freed from material desires to satisfy the needs of the body and senses, one cannot understand the transcendental abode of Lord Kṛṣṇa, Vṛndāvana. He also confirms that one cannot understand the loving affairs of Rādhā and Kṛṣṇa without going through the direction of the six Gosvāmīs. In another verse Narottama dāsa Ṭhākura has stated that without the causeless mercy of Nityānanda Prabhu, one cannot enter into the affairs of Rādhā and Kṛṣṇa." "It is not my mental concoction, but I believe in the words of Narottama Dasa Thakur that the shelter of the Lotus Feet of Lord Nityananda is as cooling effectively as the combined moonshine of millions of moons. So I am sure anyone taking shelter of Krsna Consciousness Movement will be happy. Please try to push this Movement on this process." "As to your question concerning whether relationships between devotees are eternal, the answer is 'yes.' This is confirmed by Sri Narottama dasa Thakura: 'cakhudana dilo yei, janme janme prabhu sei', he is my Lord birth after birth."